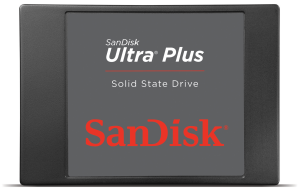 CDRLabs has taken an in depth look at SanDisk's new Ultra Plus SSD. This new consumer-oriented SSD is powered by Marvell's 88SS9175 controller chip and is equipped with SanDisk's own 19nm eX2 ABL MLC NAND to deliver up to 530MB/s read and 4450MB/s write speeds. The Ultra Plus also packs 128MB of DRAM cache and offers features like TRIM support, dynamic wear-leveling, background garbage collection and SanDisk's nCache technology which uses a large non-volatile SLC cache to improve random write performance. But If you use a TRIM-able OS you can live with that. I think the big issue here is that it has only four channels. Even with stuff like nCache you can only pump so much data through that many channels. Same goes for TRIM and GC. For the average consumer though, its more than enough. I think much of it has to do with nCache. With smaller blocks, its able to cache them quickly, but as the block size increases, it can't and its writing speed drops. Do you still have an Ultra Plus? Can you see with new CDI the Host Read/Write-values? Hmm.. I don't think the Ultra Plus returns that info. At least in a way CDI understands. 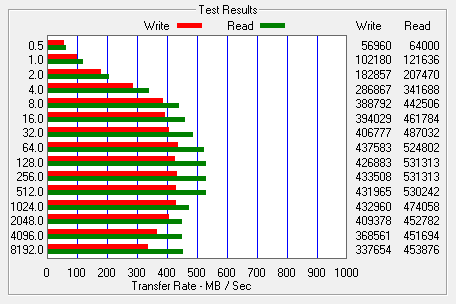 Here's a different SSD. Same computer. Same version of CDI.